Ever turn down a convertible ride because you didn't want to mess up your hair? Or, maybe you obliged, but when you got to your destination, your hair was a hot mess? Here are some tips to look fly in the car, and still be able to look put together when you get to where you are going! to tie my hair a scarf without looking like a Golden Girl! I couldn't quite figure out how to make the scarf look right or stay put. You could probably also wear a baseball hat - but it could actually fly off and these tips are for something that might match your outfit if you are planning to go out and are trying to look dressed up a little bit! Style your hair as usual until right before you are ready to leave. 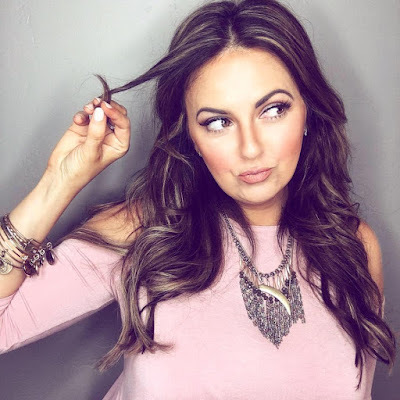 A wavy do is best, so that you can braid your hair and embrace any natural wave the braid gives you. Slip on a wide hair band of some sort and make sure it goes far enough down on your forehead that your bangs are not sticking out - every little baby hair will fly around in your eyes if it is not tucked under! Pull the bottom of the hair into a low ponytail and secure with an elastic. A thin clear one would be best! Braid your hair loosely - so that it doesn't fly around in a ponytail, and secure again at the end. Lightly spray with shine spray to tame the fly aways a little. You don't want to use too much hairspray or anything sticky, unless you want the wave to be more apparent when you unbraid your hair. Pack a small brush or comb in your purse or bag. When you get to your destination, take everything out, brush your hair out & you are golden! 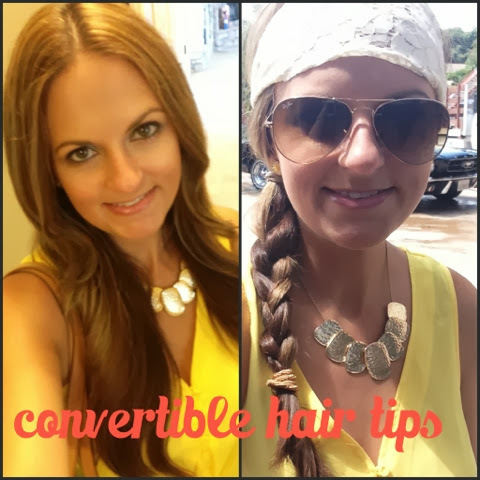 Do you have any other hair tips for riding in a convertible? What about on a motorcycle? Thanks so much! Ya, I struggled for a while trying to figure out how to ride and keep my hair decent! I am sure you dont need my tips - you are gorg! But I am flattered! :) Feel free to follow all my social media links - I will follow yours too! So happy to meetcha! I'm so glad you stopped by this week! I have loved reading your blog and your good buys and tips, and even looked at your archives this week too. You are always up to something fun! to answer your question, P is my "little" sister and built in best friend. I'm lucky to have her! And I totally agree about the blog button, as well as need to spruce up other things. My blog is an expression engine blog, which is so clunky compared to wordpress or blogspot (unless you are good at all that "techie" stuff. Did you create your own button and sell all the ads on here yourself? Hope you have a good weekend. I look forward to your next post! Yay, you too - thanks for reading my bloggie blog! Aw, you ARE lucky to have a lil sis and BFF!! That is awesome! Ya, I have never heard of expression - I have blog spot obviously, and dont know much about wordpress. I even bought my own domain name, but I am not sure how to use it. You looked pretty techie with your fancy video! I don't have the patience sometimes to try stuff like that but I love it! I read a lot online about ad companies and blog design so that is how I learned how to do most of it! Yay, looking forward to yours too! Hope you are having a good weekend! I was just working on a blog post about controlling tangles! Check back next week to see it. Thanks!..